Engineers carried out a critical hot fire engine test firing with the first new engine controlling ‘brain’ that will command the shuttle-era liquid fueled engines powering the inaugural mission of NASA’s new Space Launch System (SLS) megarocket. The first integrated SLS launch combining the SLS-1 rocket and Orion EM-1 deep space crew capsule could liftoff as soon as late 2018 on a mission around the Moon and back. 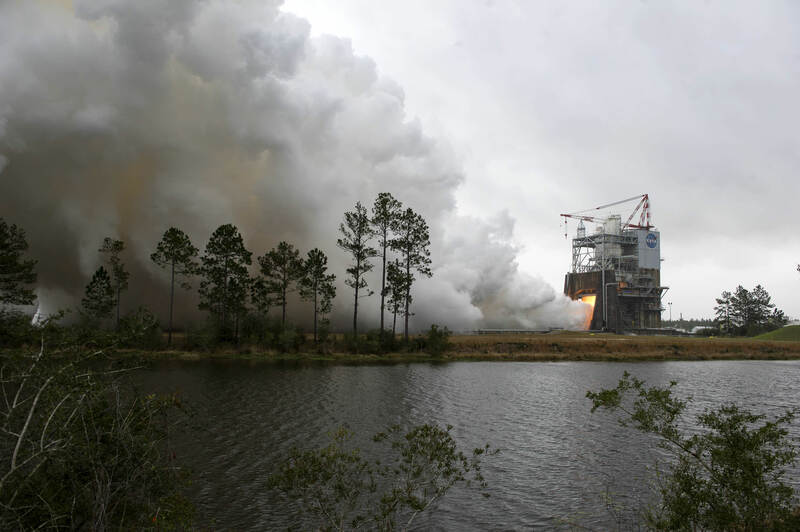 The full duration static fire test involved an RS-25 engine integrated with the first engine controller flight unit that will actually fly on the maiden SLS launch and took place on Thursday, March 23 at the agency’s Stennis Space Center in Bay St. Louis, Mississippi. The 500 second-long test firing was conducted with the engine controller flight unit installed on RS-25 development engine no. 0528 on the A-2 Test Stand at Stennis. The RS-25 engine controller is the ‘brain’ that commands the RS-25 engine and communicates between the engine and the SLS rocket. It is about the size of a dorm refrigerator. The newly developed engine controller is a modern version from the RS-25 controller that helped propel all 135 space shuttle missions to space. The modernized RS-25 engine controller was funded by NASA and created in a collaborative effort of engineers from NASA, RS-25 prime contractor Aerojet Rocketdyne of Sacramento, California, and subcontractor Honeywell of Clearwater, Florida. “The controller manages the engine by regulating the thrust and fuel mixture ratio and monitors the engine’s health and status – much like the computer in your car,” say NASA officials. A quartet of RS-25 engines, leftover from the space shuttle era and repeatedly reused, will be installed at the base of the core stage to power the SLS at liftoff, along with a pair of extended solid rocket boosters. The four RS-25 core stage engine will provide a combined 2 million pounds of thrust at liftoff. In addition to being commanded by the new engine controller, the engines are being upgraded in multiple ways for SLS. For example they will operate at a higher thrust level and under different operating conditions compared to shuttle times. To achieve the higher thrust level required, the RS-25 engines must fire at 109 percent of capability for SLS compared to operating at 104.5 percent of power level capability for shuttle flights. SLS will be the world’s most powerful rocket and send astronauts on journeys into deep space, further than human have ever travelled before. The next step is evaluating the engine firing test results, confirming that all test objectives were met and certifying that the engine controller can be removed from the RS-25 development engine and then be installed on one of four flight engines that will help power SLS-1. During 2017, two additional engine controllers for SLS-1 will be tested on the same development engine at Stennis and then be installed on flight engines after certification. Finally, “the fourth controller will be tested when NASA tests the entire core stage during a “green run” on the B-2 Test Stand at Stennis. That testing will involve installing the core stage on the stand and firing its four RS-25 flight engines simultaneously, as during a mission launch,” says NASA. Numerous RS-25 engine tests have been conducted at Stennis over more than 4 decades to certify them as flight worthy for the human rated shuttle and SLS rockets. Although NASA is still targeting SLS-1 for launch in Fall 2018 on an uncrewed mission, the agency is currently conducting a high level evaluation to determine whether the Orion EM-1 capsule can be upgraded in time to instead fly a human crewed mission with two astronauts before the end of 2019 – as I reported here. NASA STENNIS SPACE CENTER, MISS – NASA engineers successfully carried out a key developmental test firing of an RS-25 rocket engine along with its modernized ‘brain’ controller at the Stennis Space Center on Thursday, Aug. 18, as part of the ongoing huge development effort coordinating the agency’s SLS Mars mega rocket slated for its maiden blastoff by late 2018. “Today’s test was very successful,” Steve Wofford, manager of the SLS Liquid Engines Office at NASA’s Marshall Space Flight Center in Huntsville, Alabama, told Universe Today in an exclusive interview at the conclusion of the exciting RS-25 engine test gushing a huge miles long plume of steam at NASA Stennis on Aug. 18 under sweltering Gulf Coast heat. Thursday’s full thrust RS-25 engine hot fire test, using engine No. 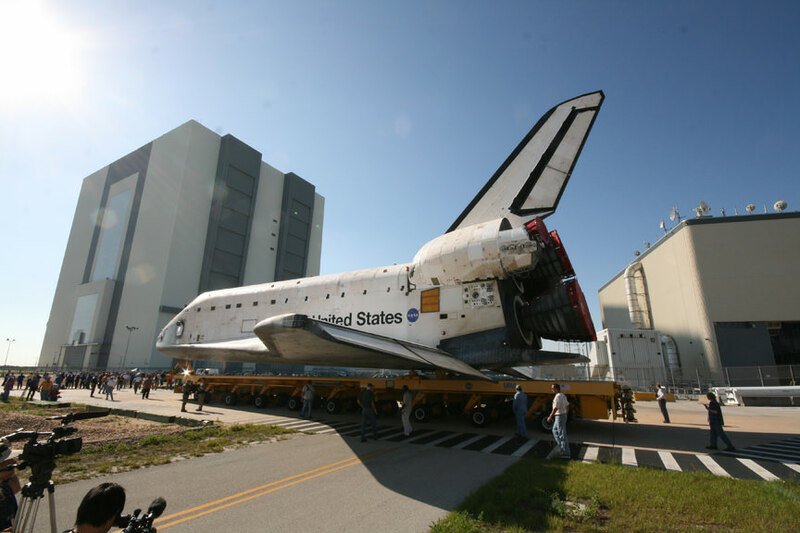 0528, ran for its planned full duration of 7.5 minutes and met a host of critical test objectives required to confirm and scope out the capabilities and operating margins of the upgraded engines ,which are recycled from the shuttle era. “It looks like we achieved all of our data objectives,” Wofford elaborated to Universe Today, after we witnessed the test from a viewing area just a few hundred meters away, with our ears protected by ear plugs. A cluster of four RS-25 engines will power the Space Launch System (SLS) at the base of the first stage, also known as the core stage. NASA’s goal is to send humans to Mars by the 2030s with SLS and Orion. The primary goal of the development tests is to validate the capabilities of a new controller – or, “brain” – for the engine and to verify the different operating conditions needed for the SLS vehicle. The test was part of a long continuing and new series aimed at certifying the engines for flight. “We continue this test series in the fall. 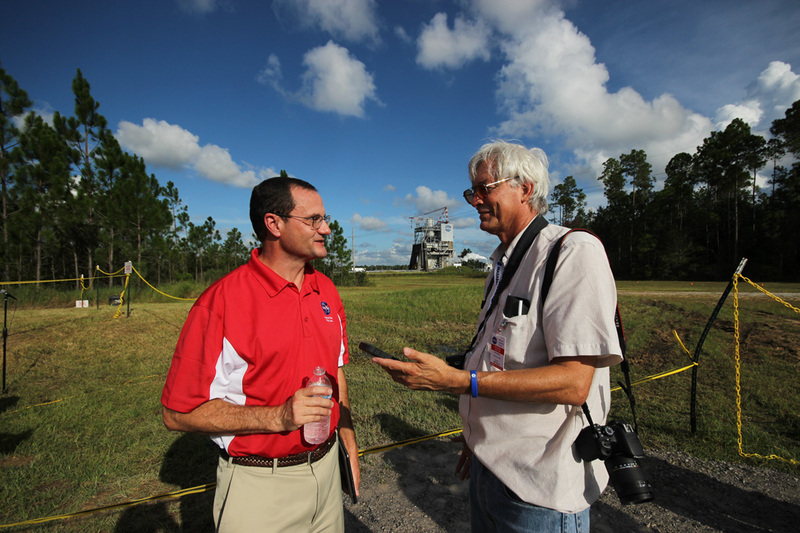 Which is a continuing part of our certification series to fly these engines on NASA’s SLS vehicle,” Wofford told me. What was the primary objective of today’s test? What are the additional objectives from today’s test? “Well you can’t do all of your objectives in one test. So the certification series are all about technical objectives and total accumulated time. So one thing we did was we accumulated time toward the time we need to certify this control system for the SLS engine,” Wofford explained. During launch they will fire at 109 percent thrust level for some eight and a half minutes while generating a combined two million pounds of thrust. The SLS core stage is augmented with a pair of five segment solid rocket boosters (SRBs) generating about 3.3 million pounds of thrust each. NASA and Orbital just completed the QM-2 SRB qualification test on June 28. Each of the RS-25’s engines generates some 500,000 pounds of thrust. They are fueled by cryogenic liquid hydrogen (LH2) and liquid oxygen (LOX). 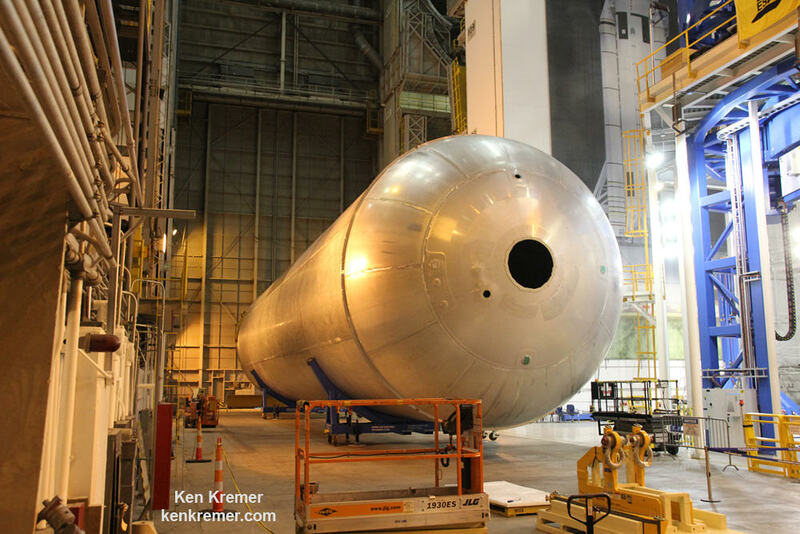 The first liquid hydrogen (LH2) qualification fuel tank for the core stage was just welded together at NASA’s Michoud Assembly Facility in New Orleans – as I witnessed exclusively and reported here. The RS-25 engines measure 14 feet tall and 8 feet in diameter. For SLS they will be operating at 109% of power – a higher power level compared to a routine usage of 104.5% during the shuttle era. Why was about five seconds of Thursday’s test run at the 111% power level? Will that continue in future tests? “We did that because we plan to fly this engine on SLS at 109% of power level. So it’s to demonstrate the feasibility of doing that. On shuttle we were certified to fly these engines at 109%,” Wofford confirmed to Universe Today. The fully assembled core stage intergrated with all 4 RS-25 flight engines will be tested at the B-2 test stand in Stennis during the first quarter of 2018 – some 6 months or more before the launch in late 2018. How many more engines tests will be conducted prior to the core stage test? “I’m thrilled. I’ve see a lot of these and it never gets old!” Wofford gushed. The hardware for SLS and Orion is really coming together now and its becoming more and more real every day. These are exciting times for NASA’s human deep space exploration strategy. “We just finished up major structural steel modifications to the ML, including work to increase the size of the rocket exhaust hole,” Eric Ernst, NASA Mobile Launch project manager, told Universe Today during an exclusive interview and inspection tour up and down the Mobile Launcher. Indeed the Mobile Launcher is the astronauts gateway to deep space expeditions and missions to Mars. Construction workers are hard at work upgrading and transforming the 380-foot-tall, 10.5-million-pound steel structure into the launcher for SLS and Orion – currently slated for a maiden blastoff no later than November 2018 on Exploration Mission-1 (EM-1). 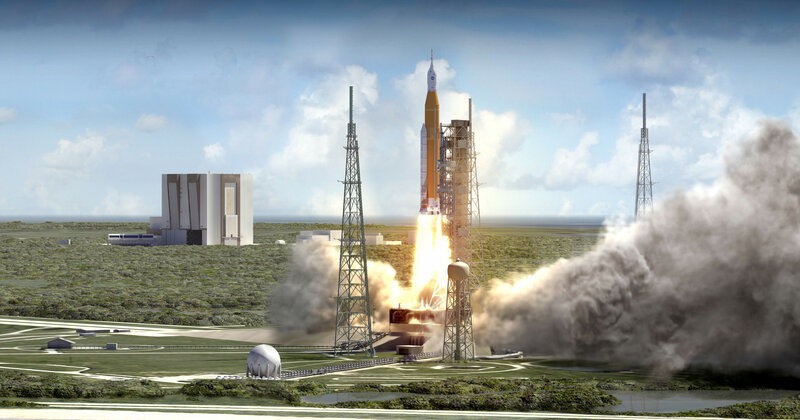 SLS and Orion are NASA’s next generation human spaceflight vehicles currently under development and aimed at propelling astronauts to deep space destinations, including the Moon and an asteroid in the 2020s and eventually a ‘Journey to Mars’ in the 2030s. The mobile launcher was originally built several years ago to accommodate NASA’s less powerful, lighter and now cancelled Ares-1 rocket. It therefore requires extensive alterations to accommodate the vastly more powerful and heavier SLS rocket. “The ML was initially developed for Ares 1, a much smaller rocket,” Ernst explained to Universe Today. Whereas the Ares-1 first stage booster was based on using a single, more powerful version of the Space Shuttle Solid Rocket Boosters, the SLS first stage is gargantuan and will be the most powerful rocket the world has ever seen. The SLS first stage comprises two shuttle derived solid rocket boosters and four RS-25 power plants recycled from their earlier life as space shuttle main engines (SSMEs). They generate a combined 8.4 million pounds of thrust – exceeding that of NASA’s Apollo Saturn V moon landing rocket. Therefore the original ML exhaust hole had to be gutted and nearly tripled in width. “The exhaust hole used to be about 22 x 22 feet,” Ernst stated. 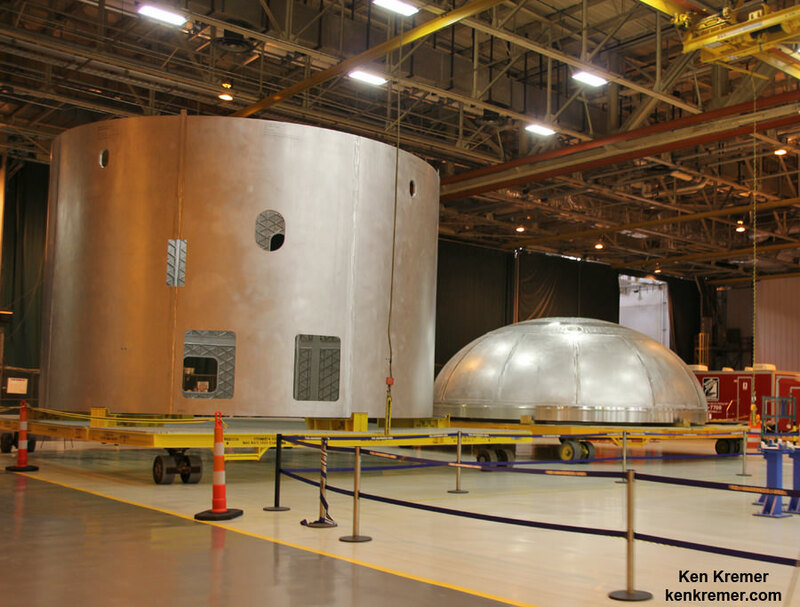 Construction crews extensively reworked the exhaust hole and made it far wider to accommodate SLS compared to the smaller one engineered and already built for the much narrower Ares-1, which was planned to generate some 3.6 million pounds of thrust. “So we had to rip out a lot of steel,” Mike Canicatti, ML Construction Manager told Universe Today. In fact this involved the demolition of over 750 tons of old steel following by fabrication and installation of more than 1,000 tons of new steel. 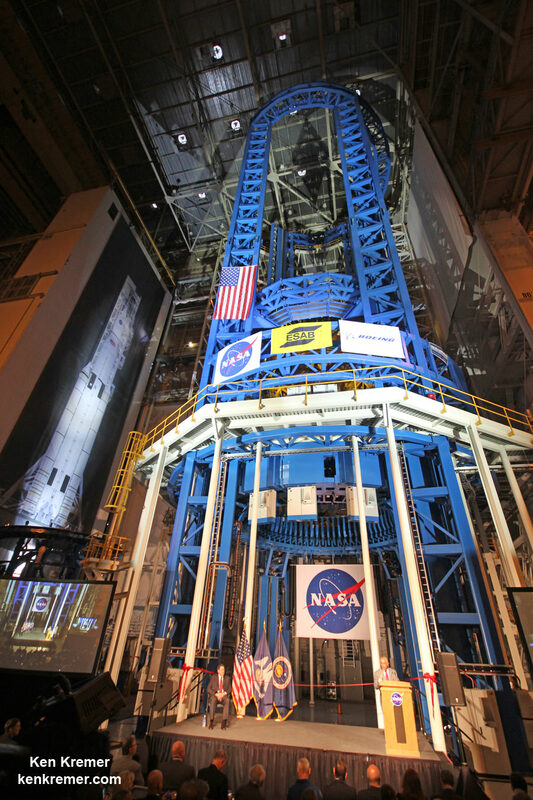 It was also reinforced due to the much heavier weight of SLS. “It was a huge effort and structural engineers did their job. The base was disassembled and reassembled in place” – to enlarge the exhaust hole. “So basically we gutted major portions of the base out, put in new walls and big structural girders,” Ernst elaborated. Meanwhile the 380 foot-tall tower that future Orion astronauts will ascend was left in place. The Ares rockets originally belonged to NASA’s Constellation program, whose intended goal was returning American astronauts to the surface of the Moon by 2020. Ares-1 was slated as the booster for the Orion crew capsule. However, President Obama cancelled Constellation and NASA’s Return to the Moon soon after entering office. Since then the Obama Administration and Congress worked together in a bipartisan manner together to fashion a new space hardware architecture and granted approval for development of the SLS heavy lift rocket to replace the Ares-1 and heavy lift Ares-5. Sending astronauts on a ‘Journey to Mars’ is now NASA’s agency wide and overarching goal for the next few decades of human spaceflight. But before SLS can be transported to its launch pad at Kennedy’s Space Launch Complex 39-B for the EM-1 test flight the next big construction step has to begin. This involves installation of Ground Support Equipment (GSE) and a wide range of launch support services and systems to the ML. “The next big effort is the GSE installation contract,” Ernst told me. NASA currently plans to roll the ML into the Vehicle Assembly Building in early 2017 for stacking of SLS and Orion for the EM-1 test flight. The SLS/Orion mounted stack atop the ML will then roll out to Space Launch Complex 39B for the 2018 launch from the Kennedy Space Center. Pad 39B is also undergoing radical renovations and upgrades, transforming it from its use for NASA’s now retired Space Shuttle program into a modernized 21st century launch pad. Watch for my upcoming story. With today’s (Aug. 13) successful test firing of an RS-25 main stage engine for NASA’s Space Launch System (SLS) monster rocket currently under development, the program passed a key milestone advancing the agency on the path to propel astronauts back to deep space at the turn of the decade. The 535 second long test firing of the RS-25 development engine was conducted on the A-1 test stand at NASA’s Stennis Space Center near Bay St. Louis, Mississippi – and ran for the planned full duration of nearly 9 minutes, matching the time they will fire during an actual SLS launch. All indications are that the hot fire test apparently went off without a hitch, on first look. “We ran the full duration and met all test objectives,” said Steve Wofford, SLS engine manager, on NASA TV following today’s’ test firing. “There were no anomalies.” – based on the initial look. The RS-25 is actually an upgraded version of former space shuttle main engines that were used with a 100% success rate during NASA’s three decade-long Space Shuttle program to propel the now retired shuttle orbiters to low Earth orbit. Those same engines are now being modified for use by the SLS. “Data collected on performance of the engine at the various power levels will aid in adapting the former space shuttle engines to the new SLS vehicle mission requirements, including development of an all-new engine controller and software,” according to NASA officials . The engine controller functions as the “brain” of the engine, which checks engine status, maintains communication between the vehicle and the engine and relays commands back and forth. The core stage (first stage) of the SLS will be powered by four RS-25 engines and a pair of the five-segment solid rocket boosters that will generate a combined 8.4 million pounds of liftoff thrust, making it the most powerful rocket the world has ever seen. Since shuttle orbiters were equipped with three space shuttle main engines, the use of four RS-25s on the SLS represents another significant change that also required many modifications being thoroughly evaluated as well. The SLS will be some 10 percent more powerful than the Saturn V rockets that propelled astronauts to the Moon, including Neil Armstrong, the human to walk on the Moon during Apollo 11 in July 1969. SLS will loft astronauts in the Orion capsule on missions back to the Moon by around 2021, to an asteroid around 2025 and then beyond on a ‘Journey to Mars’ in the 2030s – NASA’s overriding and agency wide goal. NASA has 16 of the RS-25s leftover from the shuttle era and they are all being modified and upgraded for use by the SLS rocket. Today’s test was the sixth in a series of seven to qualify the modified engines to flight status. The engine ignited at 5:01 p.m. EDT and reached the full thrust level of 512,000 pounds within about 5 seconds. The hot gas was exhausted out of the nozzle at 13 times the speed of sound. Since the shuttle engines were designed and built over three decades ago, they are being modified where possible with state of the art components to enhance performance, functionality and ease of operation, by prime contractor Aerojet-Rocketdyne of Sacramento, California. One of the key objectives of today’s engine firing and the entire hot fire series was to test the performance of a brand new engine controller assembled with modern manufacturing techniques. “Operators on the A-1 Test Stand at Stennis are conducting the test series to qualify an all-new engine controller and put the upgraded former space shuttle main engines through the rigorous temperature and pressure conditions they will experience during a SLS mission,” says NASA. “The RS-25 is the most complicated rocket engine out there on the market, but that’s because it’s the Ferrari of rocket engines,” says Kathryn Crowe, RS-25 propulsion engineer. Engineers will now pour over the data collected from hundreds of data channels in great detail to thoroughly analyze the test results. They will incorporate any findings into future test firings of the RS-25s. NASA says that testing of RS-25 flight engines is set to start later this fall. NASA plans to buy completely new sets of RS-25 engines from Aerojet-Rocketdyne taking full advantage of technological advances and modern manufacturing techniques as well as lessons learned from this hot fire series of engine tests.